Product description Ideal to collect, trade and share Take home a set of 4 squishy toys in a variety of different shapes. They're the perfect toys to collect and play with at home or trade and share with friends. They also make for great gifts for birthdays, as party favors for special occasions or as cute stocking fillers. Good clean squeezable fun Made from non-toxic, environmentally friendly material, your squishies are safe to play with from children aged 3, although always under adult supervision. Keep away from toddlers and babies. Please remember that they may smell good enough to eat, but they're a plastic toy and not food. During delivery, your squishies may get a little dented. Don't panic, they will recover their shape after a few days. Any paint odors will disappear after a few days too. Simple stress relief The repetitive action of squeezing and releasing the squishy toy is very therapeutic and works as a calming tool. It's a great way to relieve stress at your desk in the office at work, in the car if you're stuck in a traffic jam or for your children while they're doing their homework and need to concentrate. Squishies are small so don't take up a lot of space, they're light and easy to carry around - the perfect portable stress reliever. Call on us for customer service We can't improve our product offering unless we get feedback from you. Whether it's positive or needs improvement - we'd love to hear from you. We're here to help you and will do our very best to make sure that you're happy with your squishy toys and our service. Please don't hesitate to contact us. 1. 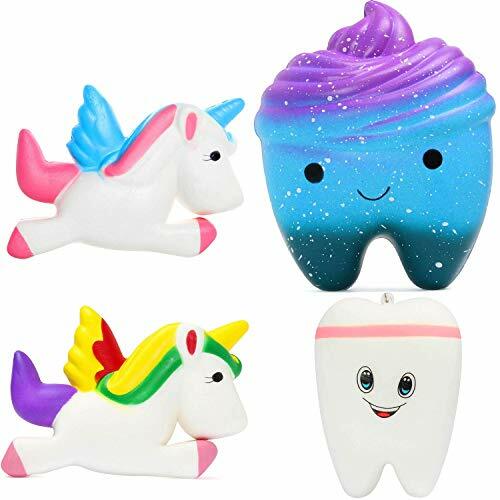 4-IN-1 PACKAGE--- 2 Cute Teeth + 2 Unicorns,amazingly textured with all the nooks and crannies. Bun with different cute faces..
2. SUPER SLOW RISING -- Take only one hand and give a big squeeze, you'll be pleasantly surprised at how slow rising squishies are. 3. CUTE SQUISHY FOR FUN: You deserve to feel relaxed and happy and this why this stress relief squeeze toy is a must have for you. 4. KAWAII & SOFT -- Made of environmentally elastic PU: soft and durable, NON-TOXIC & SAFE, multipule fruit squishies, emoticon panda and cake squishies make your family, friends and lover satisfied. 5. ENJOY AN ENTIRELY RISK FREE PURCHASE: Meeting all your demands and providing you with highest quality products is our top priority. If you are not 100% happy with your purchase, contact us and we will happily resolve any issue! If you have any questions about this product by OYE HOYE, contact us by completing and submitting the form below. If you are looking for a specif part number, please include it with your message.